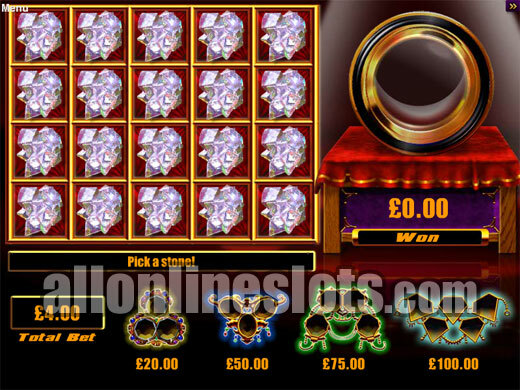 All That Glitters 2 is a WMS Gaming slot machine with cascading reels, a pick a box bonus and a Win It Again feature where you can win your last five wins again. The game uses a 27 line format and has a 40 coin max bet including the side bet. 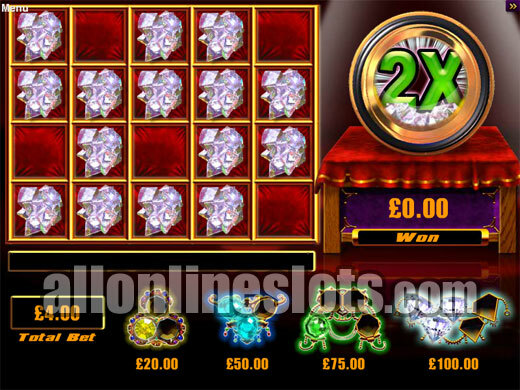 All That Glitters 2 is the sequel to the popular All That Glitters slot series from WMS Gaming. The game has rare gems theme, uses an unusual 27 line format, has cascading reels, a pick a box bonus feature and a Win It Again bonus that can award your last five wins again. Max bet on All That Glitters 2 is 40 coins per spin. This covers a one coin bet per line and a 13 coin side bet that activates the Win It Again feature. Coin sizes range from 0.01 right up to 5.00 so you can be playing for as little as 0.40 or as much as 200.00 per spin. 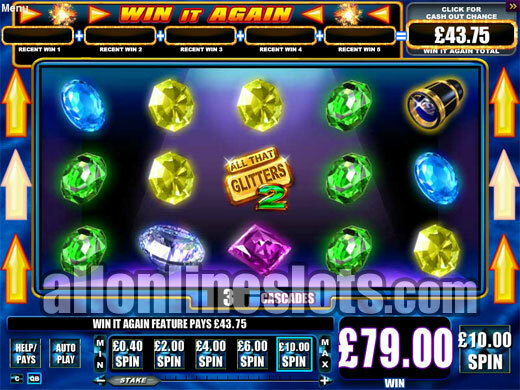 All That Glitters 2 has cascading reels which means you can get a whole lot of action from each paid spin. Once all winning lines are paid the winning symbols are removed and new symbol drop in. As well as offering extra action from each spin it is the cascading feature that triggers the Win It Again Bonus. There is a wild symbol on the reels but there is no specific pay for five wilds. 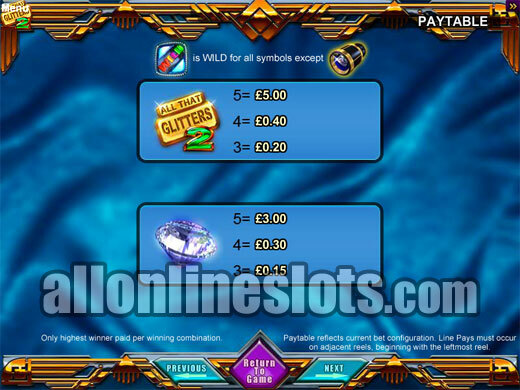 Instead the top jackpot of 500 coins is reserved for the five All That Glitters 2 Logos. While this pay might seem very small you can get the same jackpot on all 27 lines as each symbol position spins independently. * A full screen of logos pays a big 13,500 coins. After the 500 coin top pay for the wilds or the logos the rest of the five of a kind wins pay between 300 coins (Five Diamonds) and 120 coins (Five Purple, Yellow or Red Gems). Again you can get these wins on more than one line per spin so the jackpots are actually better than they look. The Jeweler Eye Loupe is the scatter symbol on All That Glitters 2. Getting three or more anywhere on the screen activates the Gem Cutter Feature. Once triggered you move to a second screen pick a box bonus where you have a grid of 20 uncut stones (Preview). 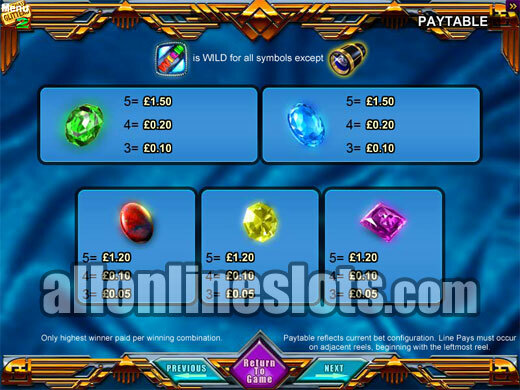 Each pick can award one of four gems, a X2 multiplier or an Add All symbol. You get to keep picking until you fill one of the jewelry setting shown at the bottom of the screen (Preview). The top award from this bonus is 1,000 times your line bet or 2,000 times if you reveal the X2 symbol during the picking stage.. 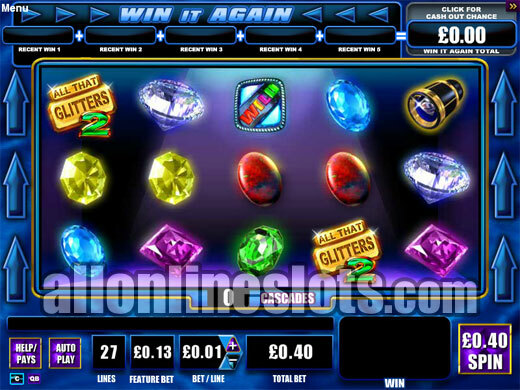 The second bonus on All That Glitters 2 is the Win It Again Feature. At the end of every spin of three or more cascades the total of any win is added to the meter on top of the reels. If you have a losing spin you can still get money added to the meter with the Mystery Boost which can award between 200 and 1,000 times the triggering bet. Whenever you get five or more cascades you trigger the Win It Again bonus which pays the last five wins again. If you want to have an instant shot at the meters you can choose to click the Cash Out Chance button. This feature gives you the chance to win up to to the total of all of the meters with a Mystery prize. If you leave the game the Cash Out Chance is automatically triggered as meter values are not saved. 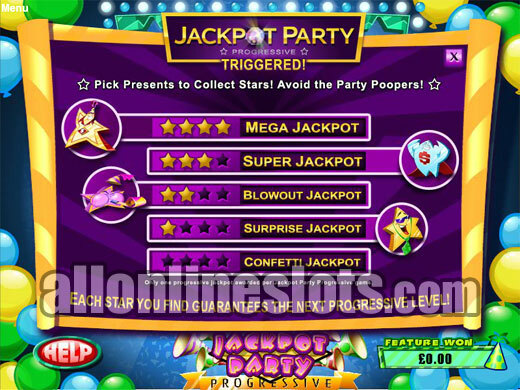 As well as all of the game features, All That Glitters 2 is also linked to the Jackpot Party Progressive. At any time you can win a shot at one of the five jackpots with the Jackpot Party bonus stage (Preview). On this bonus you pick boxes to award prizes or stars which pay the jackpots. You get to keep picking boxes until you reveal a Party Pooper.